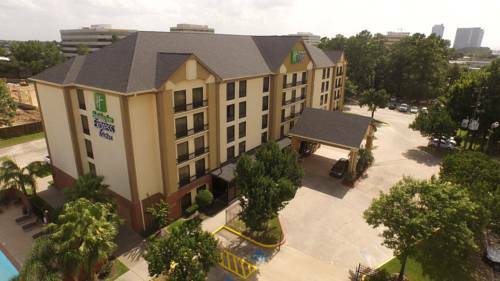 Welcome to the Holiday Inn Express Houston West Energy Corridor hotel located off Katy Freeway at Dairy Ashford, behind Texas Land & Cattle Restaurant and only 15 miles from downtown Houston. We have plenty to do nearby with the Memorial City Mall, Katy Mills Mall, Top Golf indoor driving range and Baseball USA just minutes away. Corporate locations nearby include ConocoPhillips, Exxon, Technip, Sysco, CH2M Hill, Shell Oil, 10 Corporate Center, BP, and Citgo just to mention a few. Our Holiday Inn Express has a relationship with RAC Conference Center and Norris Conference Center for your meeting, event, and entertainment needs. We provide complimentary shuttle service to nearby corporations and event centers. Enjoy our complimentary hot breakfast buffet served every morning featuring a selection of fruits, juices, cereals, biscuits, omelets, bacon, breads, pastries, and hard boiled eggs. Come experience our complimentary wireless or wired Internet access, free local phone calls, and enjoy all that the Energy Corridor has to offer. Nice room with a wet bar area and a break area built in. Complex with outlet stores for designer clothes, footwear & accessories, plus eateries and a movie theatre. CITYCENTRE is a community of sophisticated retail, elegant dining, office space, corporate penthouse residences, luxurious brownstones and lofts, upscale apartments, a full-service hotel and conference facility.